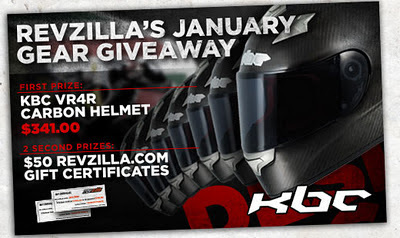 Tilted Horizons: RevZilla Awesome Helmet Giveaway! Drooling over a new high-tech motorcycle helmet such as the KBC VR4R Carbon? How much more awesome would it be if someone gave it to you? For free. Nada. Thought so. Hurry over to RevZilla's January contest page, create your Rider Profile (all of a minute's work, if you're slow), then cross your digits and wait for the monthly winner to be drawn. The First Prize winner this month will receive the KBC VR4R Carbon helmet, valued at $341. Two Second Prize winners will receive $50 Revzilla gift certificates.